It’s safe to say that cloth diapering is an addiction for me. I know it, you know it, and my husband knows it. I’ve invested insane amounts of time and money into my cloth diapering hobby. This means that I’ve learned a few tricks along the way to make things easier, and to solve problems as they arrive. 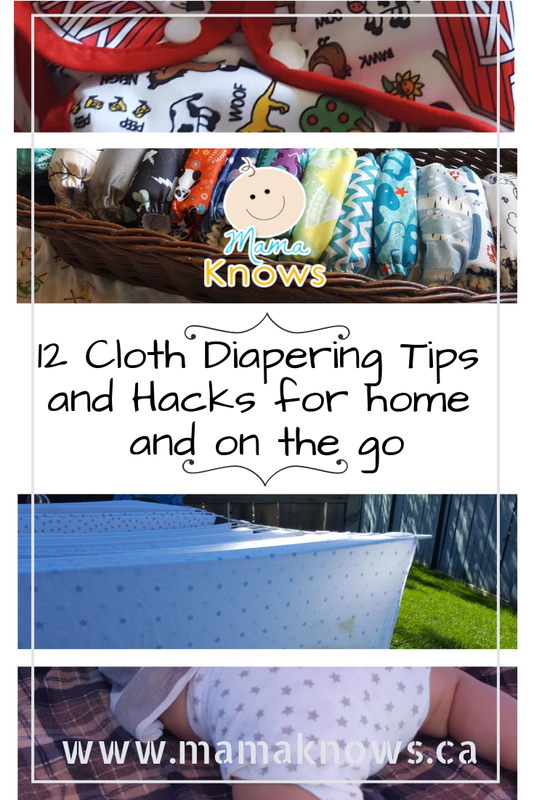 Here are 12 of my favourite tips and cloth diaper hacks that you can use to sail a smooth journey! If you use flushable liners, but don’t want to waste water to flush them when they’ve only been peed on, store them in an old disposable wipes container or a cheap lunch box until it’s full. Then they can go into your household garbage or green bin. Old CD shelving or racks make for really great diaper storage! Or, if your nursery bedding set came with a Diaper Stacker, hang that baby on the wall! It is perfect for storing clean, folded diapers that can be grabbed quickly at each change. Dollar store squirt bottles make wetting and wiping SUPER easy and cheap. If you prefer a wipe solution, just toss in a Wipes Cube every time you refill. I’ve got a bigger one on my change table and two smaller ones for the diaper bag and downstairs. Cut up old fleece blankets or pajamas to make reusable Fleece Diaper Liners. Baby’s skin will stay dry and poop will be removed easily! This is especially helpful for overnight cloth diapering because it slows down the pee to allow better absorption and less leaks. Diapers need good agitation to get clean. Sadly, agitation is not good for your elastics! 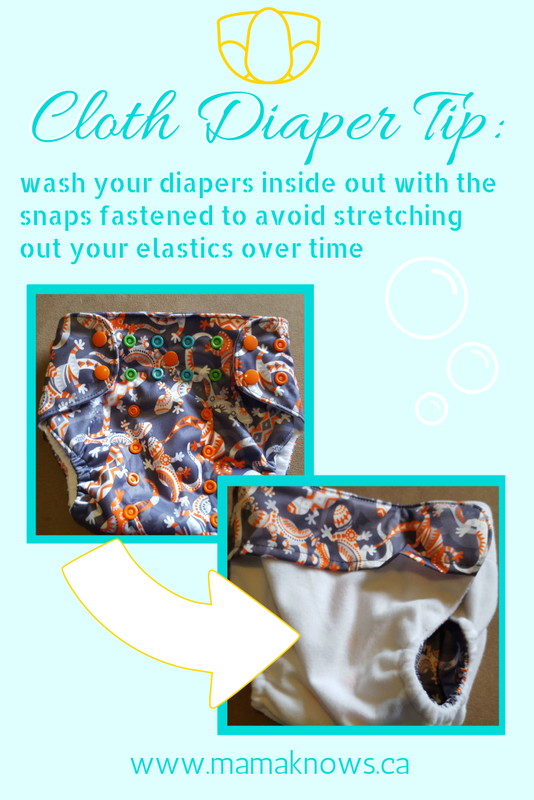 Snap or velcro your diapers closed at the waist and then turn them inside out during washing to keep your elastics in tip top shape. This is especially important for all in one diapers that have inserts attached at one end. They get wet and heavy and really pull at the elastics when caught by an agitator on a top loader, or by other laundry in the drum of a front loader. Emptied pocket diapers and covers will also last longer with this trick. Tide Powder has built in water softeners, like many mainstream powder detergent, and is very effective in hard water. Use an additional water softener like Borax or Calgon along with your tide powder if your water hardness is over 180ppm. Clean out your velcro each time you wash them to keep them like new and holding fast. Be sure to keep your velcro secured onto the waistband (and turn diaper inside out to clean) or on the laundry tabs when washing. 8. Got stains? Use the sun! Forego the dryer and head outside to hang your wet clean diapers in the sun, or in a sunny window. The sun is your best natural whitener! Spray some lemon water on them when they’re still wet to increase the whitening effects of the sun. Keep a spare One Size cover or two and some receiving blankets in a small wetbag under the seat in your car. You can padfold the receiving blankets as a diaper or use them for random messes. They’re truly one size and it won’t matter if it’s been months since you put them in there- they will fit whenever you may need them! If you can’t deal with the poop right away, roll it up inside the diaper and snap it. This only works if your cloth diaper has velcro or Crossover Snaps, but even without them it should stay closed fairly well inside the wetbag. Use all in two style diapers for on the go, as they take up less space in the diaper bag because you only need to change the inserts until baby poops. Best Bottom diapers are perfect for this! Flat diapers and covers are a great option too. Lay an empty wetbag across your carseat to combat any leaks on long drives. Not just for diaper leaks! This can help with spills too. Have more tips? Share them in the comments below! I tried your tip on snapping the waistband, & I have to say I really like it. Once you see it snapped inside out you really can see where there will be less pull on the elastics in the washer and dryer. Thanks for the tip to help LO’s stash last. I’m so glad! Someone also pointed out this tip helps avoid snap damage. It’s never happened to me, maybe because I do this trick, but she said her snaps have snagged inside the washer or dryer and broken in half. Good to know! Very good tips. Im finishing a very old dresser into a changing station. First time diving in with cloth from birth . so easy to keep everything i need within hands reach . These are some really great tips to remember–thanks for sharing! I’ve never kept extras in the car before, but I have some small muslin blankets that aren’t used in the house I could keep in the car as car seat blankets/flats along with a least reached for cover. Good idea. I love these tips! 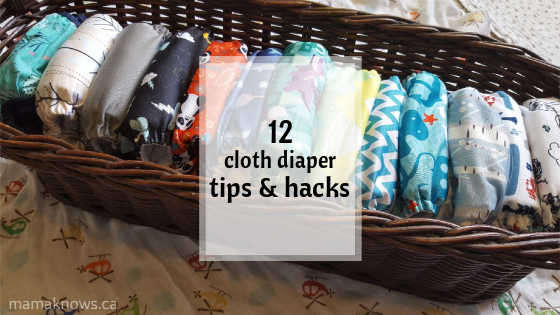 I’ve also learned that in a pinch, any clothing you don’t mind risking can be a diaper… Or diapers can be an older sibling’s underwear… And if you depend on Snappis (for flats/prefolds under wool, etc), keep an extra in the diaper bag and car. Great points! Also, my hubby’s old cotton socks make great boosters!